If you’re feeling adventurous, this amazing dessert will be sure to impress at your next get-together with family and friends. 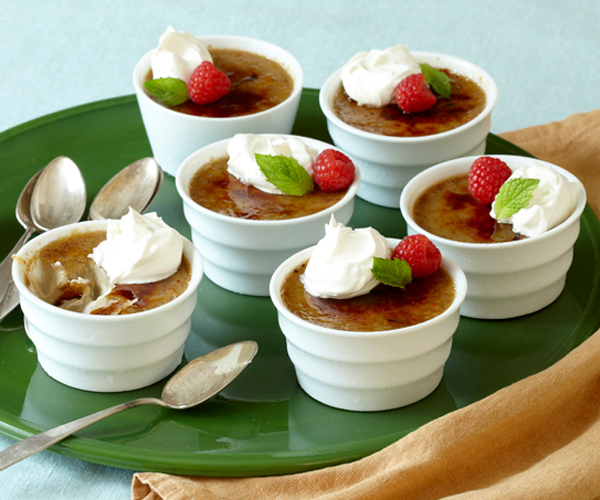 A delicious variation of the classic Crème Brûlée. Yum! Position a rack in the centre of the oven and heat the oven to 250°C. Fill a kettle with water and bring to a boil. Put six 90ml ramekins (about 7.5cm inches in diameter) in a baking dish that’s at least as deep as the ramekins. Meanwhile, in a large bowl, lightly whisk the egg yolks. Lightly whisk about 1/2 cup of the cream into the yolk mixture and stir for about 30 seconds; this tempers the yolks. Then gently whisk in the remaining cream, stirring for about 15 seconds to blend. Use a light hand—you don’t want to make the mixture frothy or the baked custards will have a foamy-looking surface. Strain the custard through a fine mesh strainer into a large measuring cup or heatproof bowl with a spout. Divide the custard equally into the ramekins in the roasting pan. Slowly pour the boiled water into the roasting pan until it reaches about half way up sides of ramekins, being careful not to get water into the custard. Bake the custards until the edges are set just under a cm from the sides of the ramekins and the centre is slightly jiggly (like Jelly), about 1 hour. To test for doneness, reach into the oven with tongs and give one of the ramekins a gentle shake or nudge. If the custard responds with a wavelike motion rather than a slight jiggle, it’s not firm enough; bake for another 5 minutes and check again. Transfer the ramekins to wire rack to cool, then refrigerate at least 4 hours and up to 3 days. When ready to serve, place the ramekins in freezer for 15 minutes. Remove from the freezer and, working with one custard at a time, top with 1 tsp. of the remaining sugar. You may need to tilt and tap the ramekin to even out the layer of sugar. Wipe any sugar off the rim of the ramekin. Hold the torch flame 2 to 3 inches from the top of the custard and slowly glide it back and forth over the surface until the sugar melts and turns a deep golden brown. Allow the sugar to cool and harden for a few minutes. Top with whipped cream, raspberries and mint leaves, if desired, and then serve immediately, before the sugar softens and gets sticky.